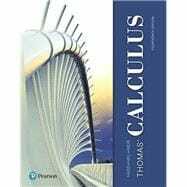 by Hass, Joel R.; Heil, Christopher E.; Weir, Maurice D.
Thomas' Calculus helps students reach the level of mathematical proficiency and maturity you require, but with support for students who need it through its balance of clear and intuitive explanations, current applications, and generalized concepts. In the 14th Edition, new co-author Christopher Heil (Georgia Institute of Technology) partners with author Joel Hass to preserve what is best about Thomas' time-tested text while reconsidering every word and every piece of art with today's students in mind. The result is a text that goes beyond memorizing formulas and routine procedures to help students generalize key concepts and develop deeper understanding. MyLab™ Math is an online homework, tutorial, and assessment program designed to work with this text to engage students and improve results. Within its structured environment, students practice what they learn, test their understanding, and pursue a personalized study plan that helps them absorb course material and understand difficult concepts. A full suite of Interactive Figures have been added to the accompanying MyLab Math course to further support teaching and learning. Enhanced Sample Assignments include just-in-time prerequisite review, help keep skills fresh with distributed practice of key concepts, and provide opportunities to work exercises without learning aids to help students develop confidence in their ability to solve problems independently. Joel Hass received his PhD from the University of California Berkeley. He is currently a professor of mathematics at the University of California Davis. He has coauthored widely used calculus texts as well as calculus study guides. He is currently on the editorial board of several publications, including the Notices of the American Mathematical Society. He has been a member of the Institute for Advanced Study at Princeton University and of the Mathematical Sciences Research Institute, and he was a Sloan Research Fellow. Hass’s current areas of research include the geometry of proteins, three dimensional manifolds, applied math, and computational complexity. In his free time, Hass enjoys kayaking. Christopher Heil received his PhD from the University of Maryland. He is currently a professor of mathematics at the Georgia Institute of Technology. He is the author of a graduate text on analysis and a number of highly cited research survey articles. He serves on the editorial boards of Applied and Computational Harmonic Analysis and The Journal of Fourier Analysis and Its Applications. Heil's current areas of research include redundant representations, operator theory, and applied harmonic analysis. In his spare time, Heil pursues his hobby of astronomy. Maurice D. Weir (late) of the the Naval Postgraduate School in Monterey, California was Professor Emeritus as a member of the Department of Applied Mathematics. He held a DA and MS from Carnegie-Mellon University and received his BS at Whitman College. Weir was awarded the Outstanding Civilian Service Medal, the Superior Civilian Service Award, and the Schieffelin Award for Excellence in Teaching. He co-authored eight books, including University Calculus and Thomas’ Calculus.